Births had to be registered from 1837 onwards. However, in most cases you'll be able and desire to go back beyond that date, but you'll need to start digging into baptismal records. In 1563 the Council of Trent first required parish priests to document births and marriages in a register, but many Catholic priests had been doing that for a long time before (there are records in France dating back to the 1300s). In England and Wales, such recording began in 1538 (after the formation of the Church of England), and in 1597 an Act of Parliament made the practice obligatory. Until the 1837 formal registration of births, parish registers were the only official records of births, marriages and deaths, Apart from being a record of these events, they were used to prove legal rights to an inheritance, the ability to hold public office or eligibility to receive poor relief. Of course, there are baptism registers beyond 1837, listing all baptisms, but they're not informative as birth registers. Believe it or not, one of the main sources for church baptism records in Britain (indeed for several European countries) is the Family History Library (or one of the branch Family History Centres) of the Church of Latter Day Saints - the Mormons. Their superb International Genealogical Index is open to everyone. Each county is indexed separately, with listings in alphabetical order, and many large public libraries and records offices have copies both for their own and neighbouring counties and facilities to allow printouts. It's easy to use, but you should be aware that it makes no pretence of being complete. There are also errors, from parishes put in the wrong county to misspellings and plain human error. Nonetheless, it's a massive undertaking, and one which has been a huge aid to many genealogists. The chances are that if your ancestors were in England over a century ago, most of them were members of the Church of England. The problem of course, is knowing exactly what church in what parish they attended. Many old records will be at the local records office, along with a map showing the ancient parish system. Some registers have been transcribed by the Society of Genealogists. For others you will have to consult the church in question. Most will happily grant access to their records. 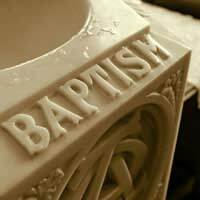 Until 1813, when a standard form was introduced, the amount of information in a baptismal entry varied from church to church. Some only recorded the name of the child (especially the older ones), but from the early 17th century, parental names were often included, with more information coming as things progressed. However, what you find depends a lot on good luck, and how conscientious the recorder was. Something you'll discover is a large number of entries for illegitimate children, who were quite common, and often noted as illegitimate by a note. If that's the case, you can often only continue to trace the family tree through the female line. But many parish registers do name the father (or possible fathers!). The father might also be found in poor relief records (the mother had to name him when interviewed). The biggest problem with any baptismal records of the 16th and 17th centuries is simply trying to read them. They were written down in a style called secretary script, which at first seems to bear only a fleeting resemblance to English. It was the common style for documents of the period, and with a little practice it can be deciphered. Then you'll find that earlier registers are often in Latin, which can pose its own problems. One small relief is that the surnames were usually in English, and dates in Roman numerals. As to the rest, it's simply a matter of translation, which can be achieved with a little time and patience. Spelling can also be a hindrance. For many years there was no established way of spelling, and often surnames would be listed in several different ways. That means you might have to cast about and use your imagination to find the correct entry. Mobility can be the biggest obstacle to finding baptismal records. Even before the Industrial Revolution, almost half the population didn't live where they had been born. As some consolation, movement was generally within a 20-mile radius. This makes more work, checking surrounding parishes, and even that might not pay off, if your ancestor moved farther away.